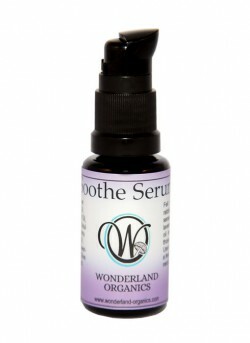 I was given Wonderland Organic’s serums product to test out recently, and I couldn’t wait to use them. I must first say how kind Alice the founder is. She always has the sweetest e-mails and is so encouraging! I feel like I have a new friend in her. I love Alice’s philosophy on skincare. A line that is organic, easily pronounceable and gentle enough for sensitive skin. I also love her commitment to sustainability, using recyclable violet glass bottles. Ok, now that you know the company and founder, I must tell you about the amazing products! The Sublime Serum is great for sensitive skin (all of the serums are). I have dry skin, but it can be oily sometimes too, and this was just what my skin needed. With organic ingredients like pomegranate oil, apricot kernel oil and argan oil, this truly is a moisturizing serum. What I loved about the serum is that it melted right into my skin and didn’t leave an oily residue. It smells amazing too, with notes of rose in it. Upon waking up in the morning my skin felt supple, moist and revived. My redness had gone down and I felt my skin looked even and awake. Both serums I tried are truly calming on the skin. I would highly recommend if you have dry to normal skin. The Soothe Serum is perfect for those who have dry/mature skin. This oil felt a bit heavier to me than the Sublime Serum, but not in a bad way. It still absorbed so well into my skin, and didn’t sit on top. With ingredients like Sea buckthorn, that is chockfull of vitamin c, this is a rich oil. My skin felt so hydrated the next morning. The lavender scent was soothing and relaxing. I had a couple of dry patches on my arm, and I put it on, and the next day the dry patches were gone! A total multi-purpose oil. I highly recommend this if your skin has dry patches, is mature and sensitive. A total winner! I had given the Balance Serum to my sister to try out. She has oilier skin and the Balance Serum is just the ticket. It’s a lighter oil and isn’t going to clog your pores or cause breakouts. She loved the lightness of the oil and how it absorbed. Her skin felt great in the morning, and she didn’t have any breakouts while using it. It has a great citrus scent. She would definitely recommend the Balance Serum! If you’ve had issues in the past breaking out because of serums being too heavy, this is your serum. The serums also come in glass pump bottles-which I love! If you’ve been searching for a serum in your skincare routine, I would recommend Wonderland Organics. Not only are the ingredients so pure, but the price point is amazing too! They retail for $39.99-a great price for a serum like this. You can buy a small sample kit first too, if you’re not sure which serum to purchase. Wonderland Organics is on Instagram, Facebook, Twitter and Pinterest. Follow for all the latest updates and beauty inspiration!